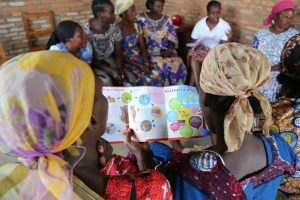 Enabling women and girls to manage their periods is increasingly on the radar of humanitarian agencies. It’s a topic that is sometimes taboo, and easily neglected when faced with more immediate crises within emergency settings. The recent trend has been to focus on the supply of sanitary pads, seeking an easy solution to a multi-faceted problem at the expense of ignoring more complex issues. To address the range of challenges, more time must be spent listening to what women need and responding to their preferences. 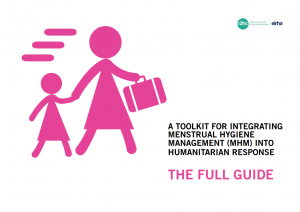 Last year’s publication of the Menstrual Hygiene in Emergencies Toolkit, with the research into it funded through our R2HC programme, has given humanitarians the materials and information required to include menstrual hygiene in cross-sectoral programming. This tool-kit was ground-breaking not only in content, but in the collaboration from over 27 agencies which contributed to its content and co-published the final tools. The accompanying research (Sommer at al.) highlighted three essential components of a Menstrual Hygiene Management (MHM) response – to ensure girls and women have access to materials and supplies, information and MHM supportive facilities (toilets and washing spaces). Each of these is responded to in the openly-available Toolkit resources. Ensuring humanitarians have access to relevant information as well as essential materials, such as sanitary pads, is one key factor. Recent funding from our HIF programme is supporting the International Federation of the Red Cross to disseminate MHM kits across its global programmes. The kits, which include reusable and disposable pads, were previously trialled across East Africa. This grant is part of our commitment to tackling the most neglected problems and scaling up innovations which have been shown to be successful. Over the past few years more humanitarians and researchers are recognising the need to address MHM challenges in the most complex contexts. A recent R2HC-commissioned report on the key research priorities in the water, sanitation and hygiene (WASH) sector placed MHM in the top five, alongside research into prevention of cholera, oral cholera vaccination and the evaluation of hygiene kits. Keeping MHM on the agenda might be more of a challenge, however. Everyday management of menstruation is always likely to appeal less than emergency responses to cholera outbreaks and the equivalent. Only by keeping in mind the voice of affected communities, and really finding out what women and girls need, is MHM likely to retain this level of attention. Sommer et al.’s research emphasises that consultation with girls and women remains the single most effective tool for ensuring that MHM needs are effectively and appropriately addressed. Putting user-centered design at the heart of innovation has been a core part of our growing WASH programmes. Listening to the needs of vulnerable groups, whether about the lighting they need to be able to access latrines after dark or to enable them to influence the design of sanitation products they use daily, is already producing impressive results. Crucially it’s giving women and girls a voice in how services are provided, and not just in a one-off consultation but through an on-going feedback loop. In a traditionally top-down and male-dominated WASH sector these experiences have often been overlooked, none more so than when considering the daily needs of managing periods. Much of the recent attention on addressing MHM needs has focused on the supply of appropriately designed sanitary pads. By contrast, too little prominence has been given to the other components of an effective package of measures highlighted in R2HC-funded research. The study author, Marni Sommer, has called for greater attention to be paid to the implementation of more female-friendly sanitation facilities and improved systems for waste management and disposal. Another priority is to improve coordination of MHM responses and sharing data across different sectors in humanitarian emergencies. Too often MHM is seen as the responsibility of the WASH sector, when ownership also needs to be shared across the health, protection and education sectors to ensure integrated response. Our R2HC programme launched a new call for research proposals on 5 June, covering the entire range of public health challenges in emergency settings. Our research funding offers a unique chance to investigate the most challenging issues through rigorous scientific study. R2HC grant recipient Professor Catherine Panter-Brick put this best when she talked about needing to move from answering more simple questions such as ‘does the programme work, and for whom,’ to questions such as ‘why and how does this programme work’. There’s plenty of scope to apply this thinking to how women and girls can be further supported to manage menstruation in humanitarian contexts. Find out more about funding available.